Kerrington Proper Phase 3 expansion of our community started in 2015 and is currently in progress with plenty of building lots still available. Phase 3 Section expansion is located on the west side of the existing community in an area of rolling ground having a mixture of open lots and lots with mature trees. All Kerrington Proper subdivision lots fall into one of two categories (Kerrington Proper and The Reserve at Kerrington Proper lots), each with its own set of requirements and price range. Review the information below for more details regarding site classifications and lot availability. Kerrington Proper sites range from 0.52 acres to 1.21 acres for discriminating homebuyers. Many sites offer the option of exposed basement views or full walkout potential. All Kerrington Proper single family residences shall have a minimum 2,000 square feet for a single-level dwelling or 2,500 square feet for a multi-level dwelling excluding non-living areas. 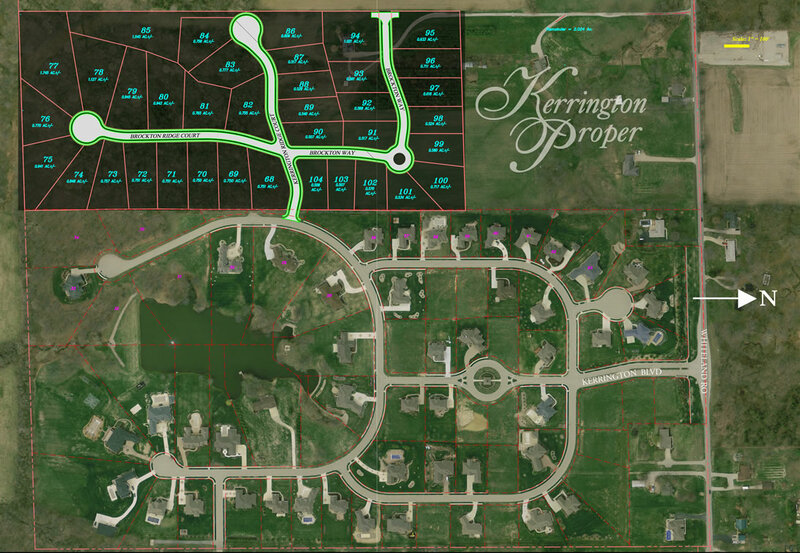 Kerrington Proper sites are Phase 1 & 2 lots 1 - 16 and lots 36 - 67 and Phase 3 lots 86 - 104. For a truly unique estate setting, consider The Reserve at Kerrington Proper sites which offer large estate settings ranging from 0.88 acres to 3.66 acres. Twelve Reserve at Kerrington Proper sites border a 4-acre private lake featuring a centrally located fountain and many offer the natural beauty of mature trees and walkout lower level potential. All single family residences in The Reserve at Kerrington Proper shall have a minimum 3,000 square feet for a single-level dwelling or 3,500 square feet for a multi-level dwelling excluding non-living areas. 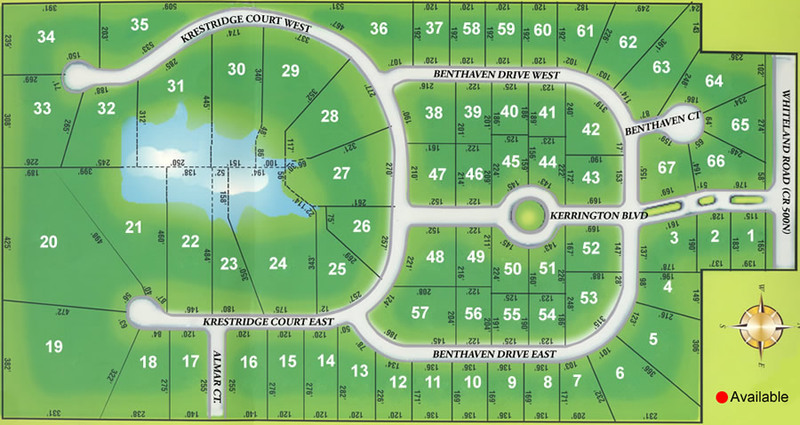 The Reserve at Kerrington Proper sites are Phase 1 & 2 lots 17 - 35 and Phase 3 lots 68 - 85. Map of the complete Kerrington Proper subdivision. Click to enlarge. Kerrington Proper Development is accepting lot reservations for Phase 3 sites and many choice lots are still available. Refer to the Phase 3 section map below for the most current information. 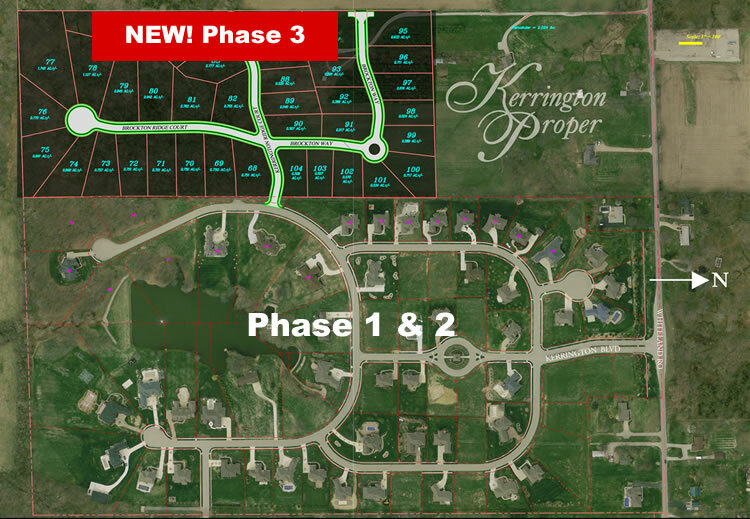 Phase 1 & 2 map shows lots available from Kerrington Proper Development LLC. Additional lots may be available from third party sellers. Red dots on each map depict available lots (subject to change without notice). Phase 3 Map of available lots (red dot indicates availability). Click map to enlarge. Click here for lot specifications and pricing. Click here to view the Phase 3 Primary Plat drawing with topography. Phase 1 & 2 Map of available lots. Click map to enlarge. We encourage you to visit Kerrington Proper subdivision to see for yourself the beauty and tranquility of our community. You will be amazed and excited at what you find. With so many amenities nearby and the growth of our area, you will understand why Kerrington Proper should be your destination for your next home. For directions, see Location page or to inquire for additional information, visit our Contact Us page.